Sportsbook.com is a popular US based online gaming site, which was founded by UK industry powerhouse Sportingbet PLC in 1996. Sportsbook.com has developed as a stronghold in online gaming as well. It has been featured in TV, billboards and magazines throughout the US and internationally. 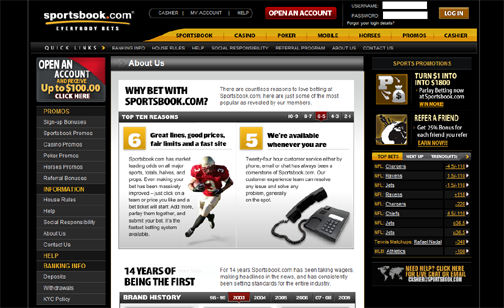 Sportsbook.com was named Egaming Review Magazine’s “Best Sportsbook” during 2005-06. After the UIEGA stepped in, Sportingbet PLC decided to sell off the US based facet of the business. Sportsbook.com is now affiliated with a larger faction who also owns Superbook and Players Only gaming brands. Our testers at SuperiorPoker were pleased with Sportsbook.com’s functionality and bonus value. Sportsbook.com has an easy-to-use online signup process. Our team was in and placing wagers in no time. Sportsbook.com is affiliated with World Gaming software. While you may find other reviews claiming this software to be a bit “laggy” during peak traffic hours, our team found it to be consistent. Our team did, however, find the website interface a bit complex, and at times difficult to navigate. Other facets (decent bonus action) about the site tend to balance this matter. Maximum: NFL – $5,500, NBA – $2,200 and MLB – $3,000. Sportsbook.com only accepts wagers online. No phones. Football, baseball, basketball, hockey, auto racing, horses, golf, soccer, boxing, tennis, and entertainment events. Sportsbook.com uses a normal 20 cent line unless otherwise stated. Sportsbook.com tenders new players a 10% new account bonus. Sportsbook.com offers reload bonuses at 10% with a $500 maximum. There is an enticing Sportsbook.com $100,000 Perfect Parlay Contest in which if you predict all the winners for the weekly NFL spread, you are entered for a chance to be a grand prize winner. Reduced Juice Fridays on NFL action. Saturdays offer weekly no juice on NCAA Football action. Thursday Triple your Winnings offer allows for chances to cashout big on select bets. There is a Multiple Team Parlay Challenge: select 13 teams, bet $25 or more for a chance to win $100,000. During select weeks, Sportsbook.com will refund all money line bets if the team you wagered on gets shutout. Action changes up weekly at Sportsbook.com. Sportsbook.com has an excellent Customer Service Team – available 24/7 via email, phone and live chat. Sportsbook.com has been noted for slow payouts due to processing issues that the entire experiences on occasion. Our testers state no risks for payout process and recommend Sporstbook.com. Sportsbook.com deposit methods: Credit Cards, Ecocard, Cash Transfer, Moneybookers and Neteller. Withdraw methods: Wire Transfer, Ecocard, Check/Gift Card, Moneybookers and Neteller. Sportsbook.com has a lot to offer in addition to sports. You can also play the casino, poker and horses. They also support in-game betting, attractive bonuses, reduced juice, live odds and fantasy betting. You can also test the demo login available if you want to experiment with the site prior to joining.